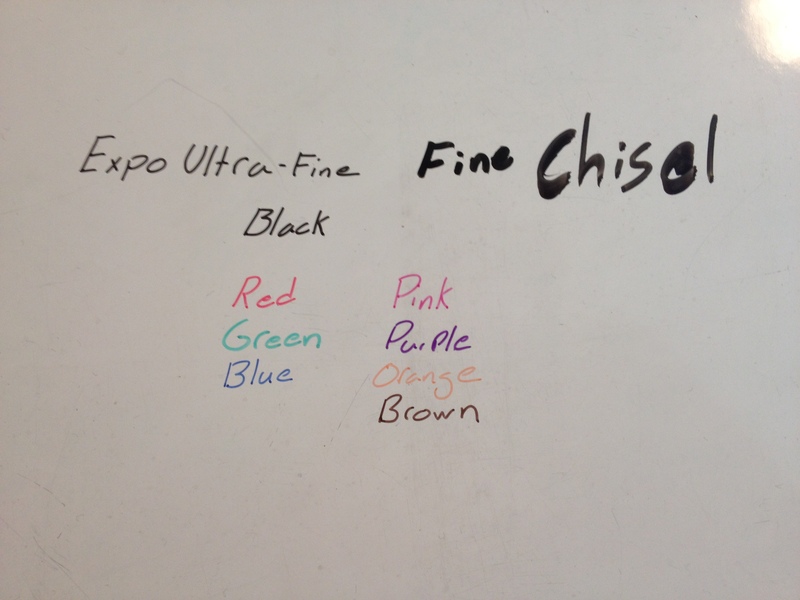 I’ve looked at the 4 most common Expo marker colors (specifically in the Ultra-Fine tip) in the last few weeks, and this week I’ll look at 4 of the lesser-seen colors: pink, purple, orange, and brown. Pink- to start with, the pink is a nice, dark pink that looks much more pleasant than the common pinks found in writing utensils. It’s rosy, and very consistent; the line width is medium, though. Purple- next, the purple is a very bold writer, it goes on smoothly and with a lot of ink, but there is more variance in the color when dry. It is a nice, dark purple, and unmistakably so. It might be confused with black from far away, but is generally distinguishable. Orange- the orange is very thin, both in line and in color. It’s sometimes hard to tell it’s there at all, and there is a wide color variance within it. I’m not a particularly big fan of it. Brown- and finally the brown, which is another wide-writer. 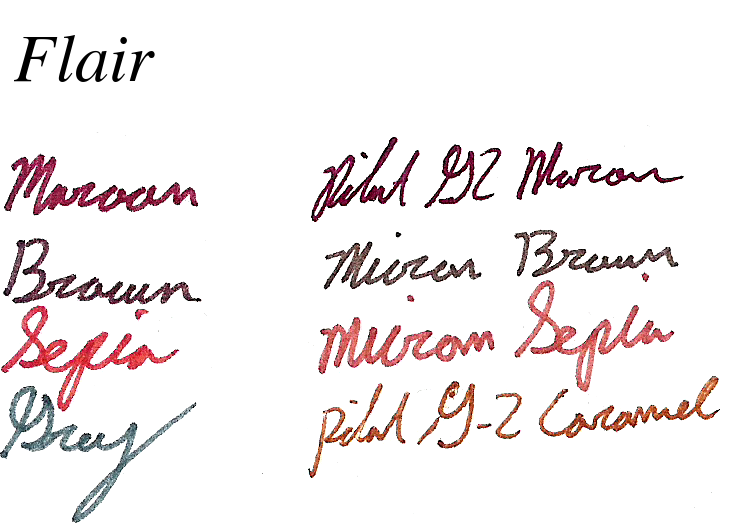 It writes smoothly, with the only color variance being in the tips. 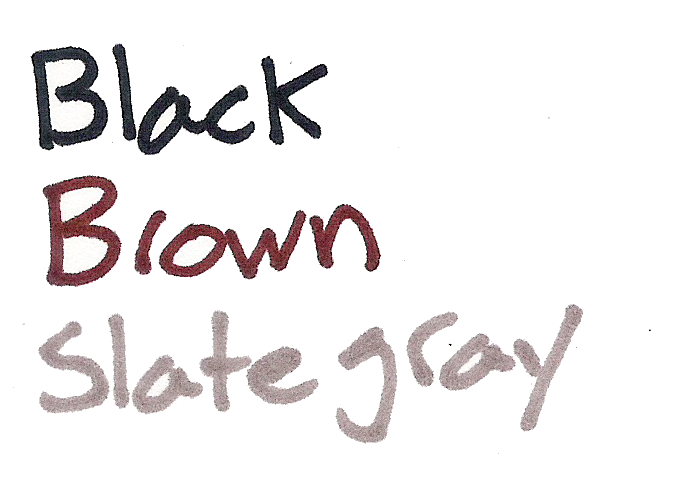 It’s a dark enough brown to be easily read, and still distinguishable from the other dark colors. Overall, these 4 are a nice addition, though they aren’t my favorites, either in performance or in looks. I like them, but if I were just getting these for a class I would skip them. 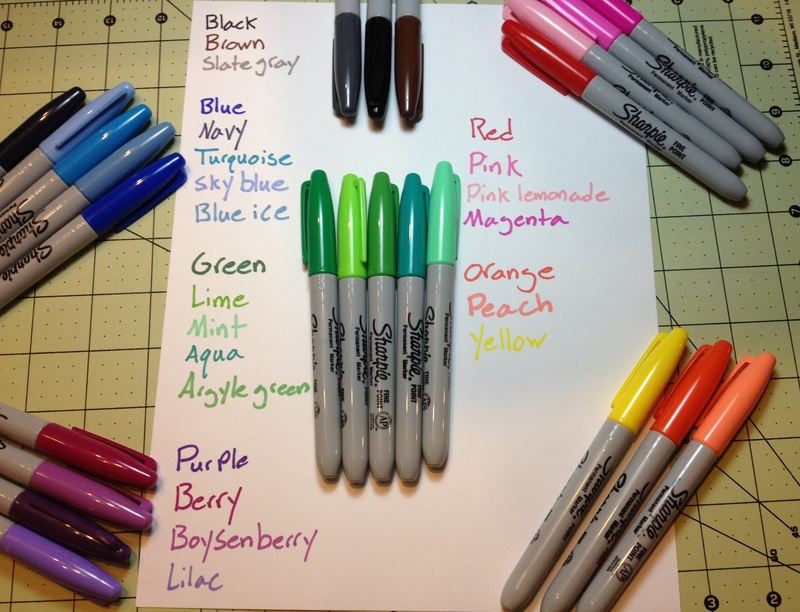 For organization, note-taking, and art, these colors have a better purpose, but those aren’t the main purpose of dry-erase markers. So now we get to the final group of the Micron colors that came in the 8 pack of Micron colors. These are the weird or non-standard colors, in my opinion. The first is Rose, which is a pink: they just call it Rose to make it fancy. It’s a very deep, pleasant, pink color, not like the very vibrant, in-your-face pinks that dominate what is considered pink these days. It doesn’t really approach purple, but it is darker than most roses I’ve ever seen. It’s surprisingly nature-y for a pink, though. It does have some problems with bleed-through on thin paper, but not a lot. Next we have Brown, which I would call light brown. I would say it’s sort of a fertile, soft, earth color. Again, for a light color it’s fairly subdued, not like a Crayola pencil or anything. Again, it’s surprisingly real looking. It has no problems with bleed-through at all really, and goes well in a landscape. Finally we have Sepia, which I call dark brown. It’s very mud-like. Another deep, saturated color. It can get very saturated though, and end up looking like black in the final product, so it does take careful application. It also tends to pool, resulting in spots of darker color. Some skill is required to get it to look right. Surprisingly, though, it has very little bleed-through even on thin paper. These ‘non-standard’ colors are very nice overall. If one is looking to do nature sketches, landscapes, etc. these are quite nice. They are very subdued and blend in nicely. I find them much more pleasant than the bright reds and blues of the other Microns. If you just want standard colors for organizing or technical things, these are not the pens you need. However, if you’re drawing a lot of the outside, or in cool colors, these are fantastic.